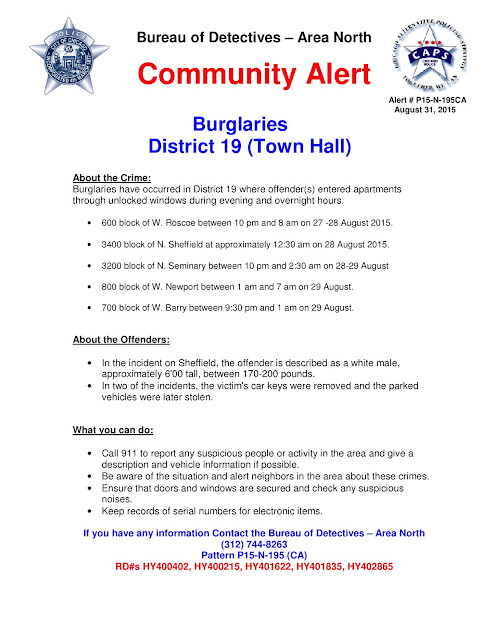 Remember the surge in burglaries that we told you about this weekend? Well, the Chicago Police Department just issued a community alert to warn Wrigleyville and Boystown residents of….a surge in burglaries! According to the alert, the offender(s) have been entering apartments through unlocked windows during evening and overnight hours. • 600 block of W. Roscoe between 10 pm and 8 am on 27 -28 August 2015. • 3400 block of N. Sheffield at approximately 12:30 am on 28 August 2015. • 800 block of W. Newport between 1 am and 7 am on 29 August. • 700 block of W. Barry between 9:30 pm and 1 am on 29 August. Police also confirm CWB’s report that two of the burglary victims also had their cars stolen.. Anyone with information is asked to contact Area North Detectives at (312) 744-8263 in reference to pattern P15-N-195 (CA. A resident of the 1300 block of Roscoe came home around 11:30PM Monday and found a door forced open and their home burglarized. A report was filed. And, Sunday evening, two women returned to their apartment in the 3500 block of North Halsted, only to discover their home had also been ransacked and burglarized. Email us. Facebook us. Twitter us. County judge unleashes on prosecutor as more and more people aren't getting the "Smollett Deal"